It’s been a while since I’ve posted an update on trntxt, and in that time lots of things have changed. Most of those things haven’t changed the site’s appearance at all, but I can assure you that I’ve been very busy with it over the past few weeks. In order to make those changes simpler to implement, I had to make quite a few changes in the background. In doing so I learned more about the Jade templating engine and created a Mocha test framework with the help of Thom Wright at one of the Hack Nights run by CodeHub Bristol. When typing a station name in the address bar, a more complex search takes place. Beforehand in order to match a station, the input had to match a portion of the station name exactly. Take for example, the station ‘Heathrow Airport Terminals 1, 2 and 3’. Originally, if you searched for ‘terminal1’, it wouldn’t produce a match. Trntxt removes all spaces and punctuation from the station name, but even then ‘terminal1’ doesn’t appear exactly in the station name – you’d need to have ‘terminals1’ which isn’t immediately obvious. Now it checks the station name to see if all the characters are there in the right order. You can type ‘lonwat’ for London Waterloo and it will return the match. While writing the improvements to the search function, I made sure that the changes didn’t break anything else by running the tests. 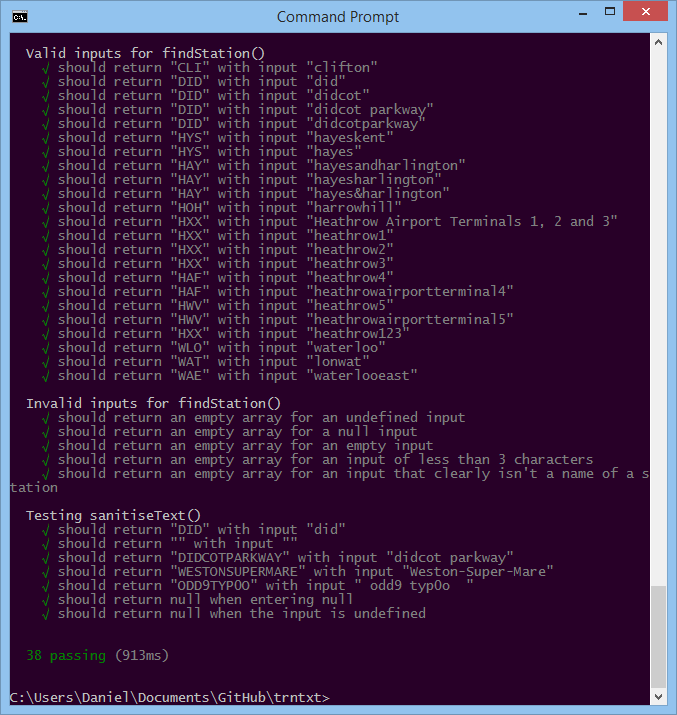 The test framework essentially contains a list of inputs along with their expected outputs. When I wanted to write a new feature or fix a bug, I’d put in some failing cases with the result it should return, then I carry on coding until the tests pass. By running the tests automatically each time I save the code, I can be confident that the new code doesn’t negatively impact any of the past test cases because they are all checked every time. I decided that while still being minimal, I could improve the appearance of trntxt’s output. The 4 dashes I originally had to separate items have been replaced by a line; I’ve reduced the wordiness of each item description and the CSS fits inside a tweet (just because)! While investigating the network traffic to trntxt from different devices, I noticed that Android devices wanted to download the high resolution app icons for Apple devices, which is a bit of a waste when that icon is never shown. I now run a check to see what device is accessing the site, and only send links to appropriate icons for that device. It’s fairly unnecessary and especially not worth the effort to do it, but I did it anyway. Turns out it’s easy enough to modify the content of Jade documents based on various parameters, plus I was annoyed that all the icon tags almost doubled the size of the response (see below). I probably shaved nanoseconds off the page load time. I’m not finished yet! There’s always something else I want to add to trntxt. Search suggestions coming soon! In this post I’m going to talk about what I’ve done (and what I’ve not done) with trntxt in order to get the fastest page load times possible. I’ve split this up into two sections. The first part might be interesting to most of you, whereas the second part goes into technical detail that will look like complete gobbledygook if you haven’t programmed using Node before.